Firstly, remembering all the precious life’s lost this day 14th years ago. Praying for them and the loved one’s they left behind. America the Resilient Nation. My husband and me have really enjoyed this recipe for the last couple weeks. I have been making it quite often since I found that Costco has the best priced Portobello Mushrooms in my area. Since we avoid eating rice for most of our meals cooking healthy but well seasoned vegetables has become a necessity to replace rice. What I love about this recipe it is vegan, vegetarian and taste better the next day. 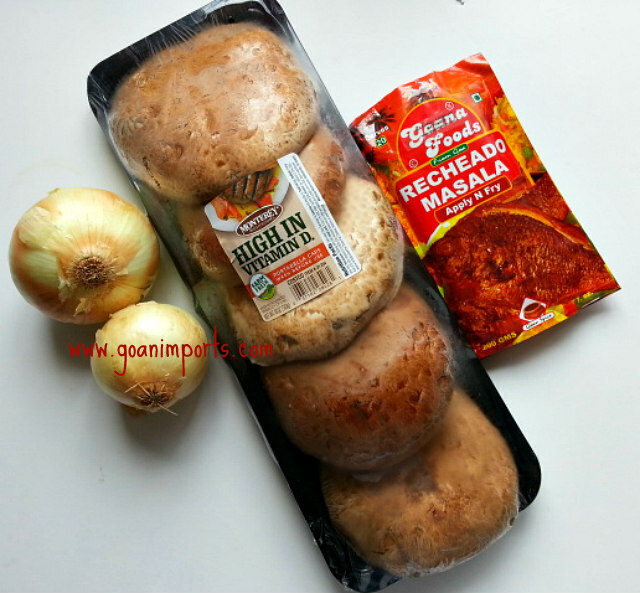 It you want to just grill the mushrooms than you can use the recheado masala as a marinade as well. Serve with rice. Use left overs to make sandwich with some mayo or as a filling for a wrap. Stuff into puff pastry sheets the sautéed Portobello’s and bake to make a quick snack. With a wet cloth cleans the mushroom gently. Take the gills with the back of the spoon (If you do not clean then it makes the mushrooms almost black in color). Slice them length wise. In a heated skillet saute the onions till translucent. Add the recheado masala, sugar, mushroom and salt to taste. Saute for 7-10 minutes till the mushrooms are tender. This recipe is perfect for weekdays for busy people on the go since you need only 3 ingredients and little prep work ahead. It stays well for a couple of days in the refrigerator and can be used in many ways. 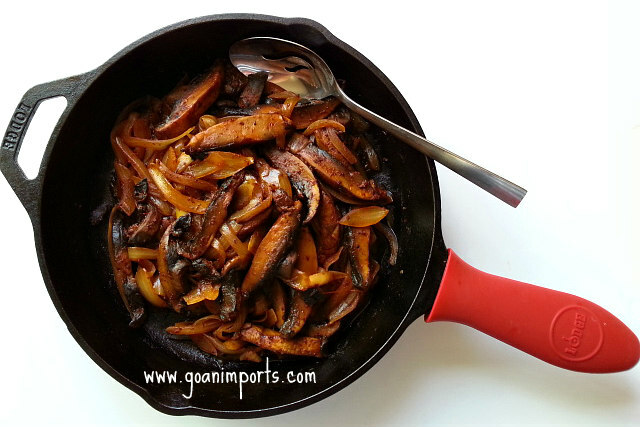 If you have a recipe on how you cook your mushrooms than please feel free to share your link in the comment section of this post. That looks quick and tasty. How many types of masala are there? Our grocery store has tekka masala. I have not seen recheado masala. India has a lot of masalas and they vary from state to state. So it is hard to find all of them out here at the stores. I only sell them online. This looks like the best recipe yet! You are so welcome and I am happy to know that. I would encourage you to give it a try 🙂 And Thank you! Yippie 🙂 it’s wonderful to see you’re posting again . OMG! MUSHROOMS are My spouse’s FAVOURITE. I bet She will prepare SPICY SAUTEED PORTEBELLO MUSHROOMS the next time She buys some mushrooms. She is OVER THE MOON with this recipe, Nandini another one of Your FAB recipes. Let them recipes keep coming. Great to know that one of Our own comes out with the best of recipes. Looking forward to My next shot of NANDINI MAGIC. Thank You Mr Stan for your always kind and encouraging words. 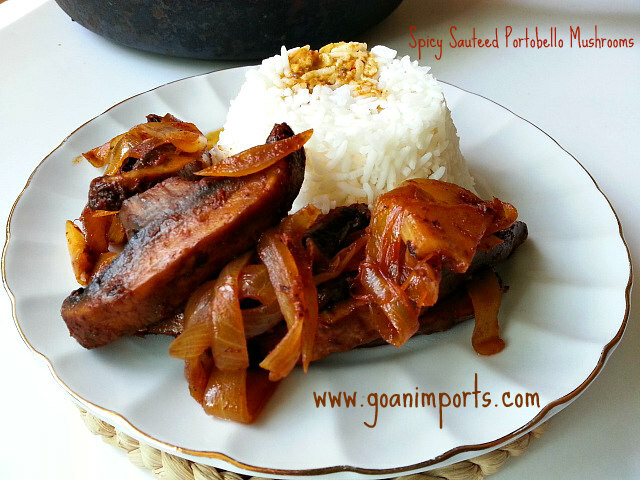 Trying to do my best to make Goan heritage know. I am so happy to know that Mrs Stan love’s mushrooms and hopefully enjoys my recipe. Take care and Regards. I just love mushrooms! These look delicious! 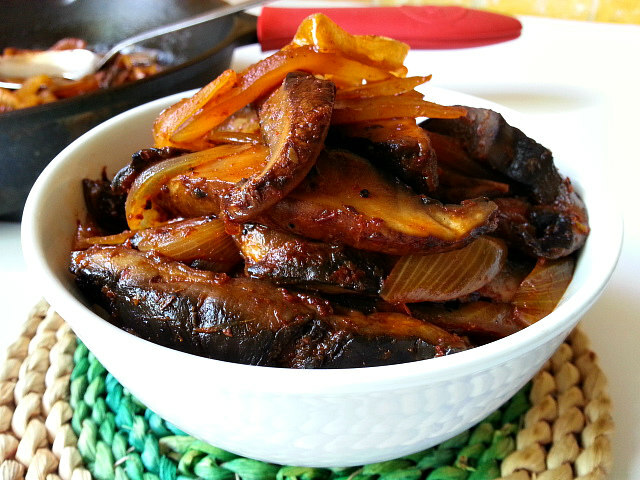 Love this recipe of cooking mushrooms in an unusual way. Made my mouth water. I think it goes best with boiled rice. Would sure make it. I think I have found what we’re having for dinner tonight! Sounds simple. Looks delicious. Mushroom and spicy is a combination I wouldn’t have thought of on my own. These look delicious. I LOVE portebello mushrooms. Tried this tonight. Tasty little dish. I added some fromage freaks and chopped tomato sections. WOW! These mushrooms would be scrumptious served over some grilled chicken, MMM! Thanks Nandini! Having just spent a few heavenly days cooking just picked Shiitake, I’m loving this one. What a flavorful, yet easy dish for a weeknight, that rechado masala will perk anything right up. I guess this is like a chilli fry. Another recipe on the list to try – I can almost smell the mushrooms! Thanks!! Any ideas for places to visit I will be going in the end of October and of course restaurants and foods to test? I know you are somewhere in America, but I am going to Goa. Places that the locals love; and of course the food and the drinks and the beaches. Have not tasted before mushrooms that are both spicy and salty. Will try. Looks delicious.Cant wait to try. I intend to enjoy the Fall like weather. You do the same as well, always a pleasure to see your post. That is nice. We are having a heat wave out here in LA. Looking forward to the cool off soon. Thank You so much Cheryl for thinking of me. That is very kind and sweet of you my friend 🙂 . Will definitely check it out.